The EMBA Forum is one of the major activities of EMBA Program of The Chinese University of Hong Kong where eminent business leaders are invited to share their valuable experiences, insights and wisdoms with EMBA alumni and other forum participants. 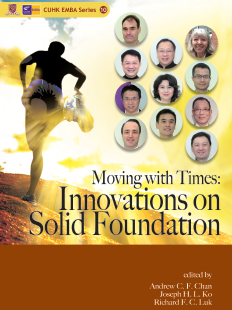 This compilation demonstrates positive attitudes and creative thinking of the above highly-regarded leaders in Hong Kong. Inspiring and thought-provoking issues are also discussed that readers, especially executives today and leaders tomorrow, would find this book helpful in enabling them to excel in the intensely competitive and changing world. Professor Andrew C. F. Chan (陳志輝), SBS, JP, is the Director of EMBA Program in the Chinese University of Hong Kong (CUHK). On 1 July 2010, Professor Chan took up the headship of Shaw College, CUHK. Professor Chan excels in teaching and was awarded the Vice-Chancellor’s Exemplary Teaching Award in 2001 and 2009. Professor Chan has been active in participating in public service. From 1999 to 2005, he was Chairman of the Hong Kong Consumer Council while from 2004 to 2010, he was Chairman of the Hong Kong Deposit Protection Board; and from 2005 to 2012 he was a Member of the Electoral Affairs Commission. Currently, he is Chairman of Chinese Medicine Council and Process Review Committee of Hong Kong Monetary Authority. In addition, he is Director of Hong Kong Applied Science and Technology Research Institute Company Limited (ASTRI). He is also Committee Member of Clearing and Settlement Systems Appeals Tribunal of Hong Kong Monetary Authority, Member of Chinese Medicine Development Committee, and Quality Tourism Services (QTS) Committee. Prof. Chan has coordinated and hosted the popular TV and radio programmes ‘Talking to CEOs’ and ‘New Thinking in Management’, which are aired on RTHK Radio, Cable TV, now TV and bbTV. Mr. Joseph H. L. Ko (高厚良) currently lives in Sydney, Australia. During his career, he spent over 17 years at Cathay Pacific in Hong Kong covering various positions in marketing, project management and strategic planning. He also worked 3 years in a travel technology company in Tokyo as Head of Marketing. A graduate from the University of Hong Kong, he obtained his MBA from the University of Michigan, Ann Arbor USA. Arriving in Sydney in 1998, he started his own individual consulting services and received contracts to work for a couple of corporations in Singapore. Influenced by his exposure to entrepreneurship during his MBA studies, he decided in 2004 to turn himself into a small business owner instead. Between 2005 and 2008, he acquired two food service stores in Sydney and managed to achieve significant sales improvements. Being also a part owner of a business brokerage firm, he provides consulting services to help aspiring small business owners with business plans and strategies. Seeing the high failure rate in small business and the resulting damage to people’s lives, he is now taking time to write a small business blog hoping that as many people as possible will resist and stop using a ‘paid job’ mentality to run small businesses. Mr. Richard F.C. Luk (陸仿真) was former Director of the HKSAR Government’s Economic and Trade Office in Chengdu. He joined Government as an Assistant Labour Officer in 1977. In 1980, he quit the job that he loved to pursue religious studies at the Trinity Evangelical Divinity School in Deerfield, Illinois USA. Then in 1986, he joined Government again as an Administrative Officer. During the following 23 years as a career civil servant, he held responsibilities in a wide range of fields. He worked in various posts in home affairs: twice as District Officer, first in Wong Tai Sin and, after some years, Tsuen Wan. He also worked on district council policy and in rural affairs. He worked in civil service personnel management, and on salaries review. Other major responsibilities during his career included company and securities legislation, education, trade and industry, civil aviation, consumer protection, and SARS review. His final assignment was to set up the HKSAR Government’s Economic and Trade Office in Chengdu, where he was Director from 2006 to 2009. He returned to Hong Kong upon retirement in August 2009.